The Ypsilon BC1 transformers are used for converting an unbalanced signal to a balanced one. They can be used with any kind of unbalanced source like cd-players, phono preamps, line preamps etc. They can also be used for breaking ground loops in a system, lowering the total noise floor and improving the interface between equipment by providing galvanic isolation. Each BC1 Transformer has Two inputs, One RCA Nextgen connector and One female XLR Neutrik connector with pin 1 and pin 3 grounded. The output connector is a XLR male Neutrik connector. Pin 1 is the center tap of the secondary coil that is connected at Pin 2 and 3 respectively. Pin 2 or pin 3 therefore should not be connected to ground. The BC1 transformers use a proprietary high performance Cobalt based amorphous core material of very high permeability that is very linear with frequency and flux level. This specific material is regarded to be one of the best magnetic materials available today. The BC1 transformers are optimized sonically to be as transparent as possible. In this way they can improve the performance of a system since they provide a better interface isolation between devices. The signal ground current doesn’t travel through mains chords but only through the interconnect cables, maximizing in this way the overall performance of the system. 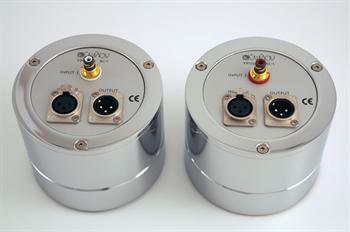 The BC1 transformers are shielded with mu-metal and potted in 10mm soft iron with a nickel coating. Outside magnetic field interference is kept to a minimum.